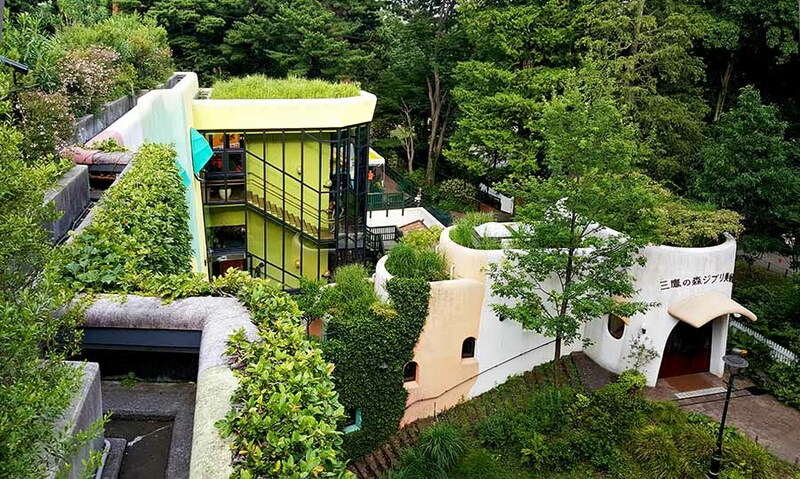 The Ghibli Museum in Mitaka, Tokyo, is a “dreamland” for Ghibli film lovers, young and old. Since its opening in 2001, it’s been attracting visitors from around the world as one of the most popular museums in Tokyo, despite not being so easy to access from the city center. 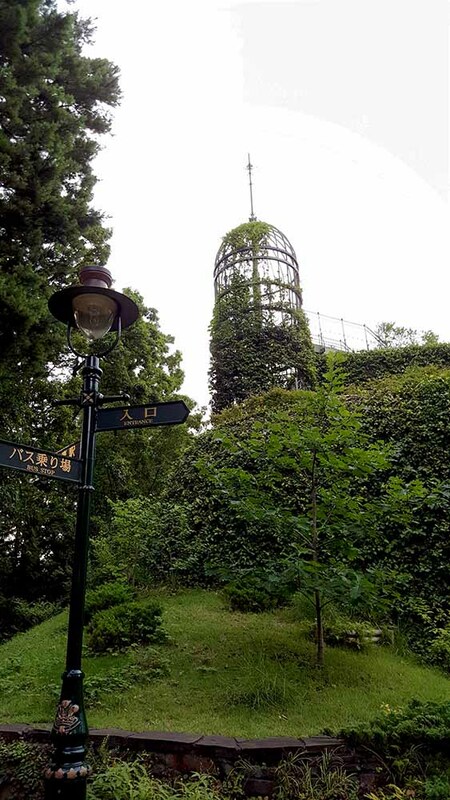 It’s located in a western suburb of the metropolitan area, close to Studio Ghibli’s headquarters. The area still preserves some of its earlier old/natural/tranquil environment. 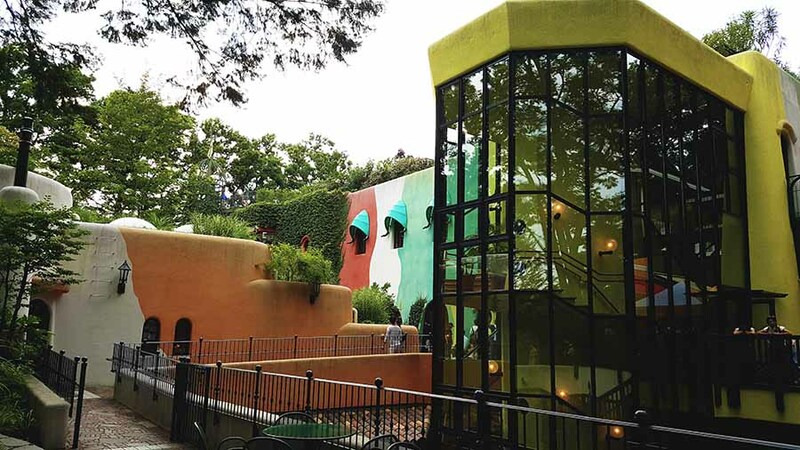 The Ghibli Museum is by no means a small-scale Disneyland. 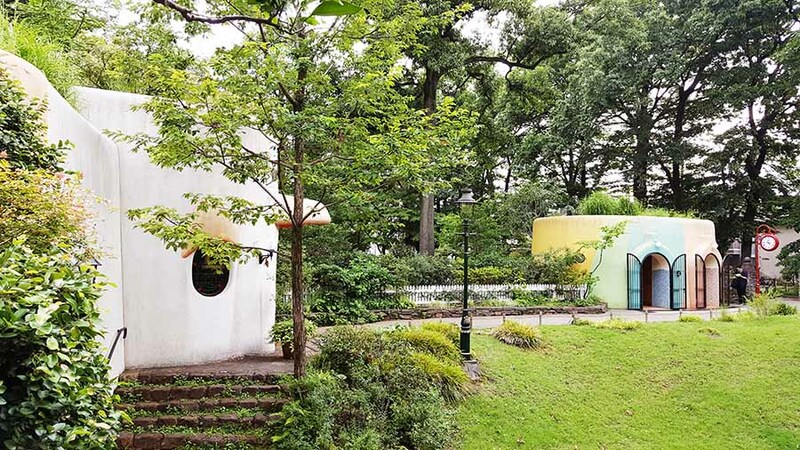 Originally conceived by Hayao Miyazaki and realized by his son Goro Miyazaki – who was a landscape architect before he joined the project – it is a relatively small, three-story building that has an atrium at the center. Finished mostly with wood, the place offers an incredibly intimate atmosphere and is full of peculiar details such as super-narrow staircases or hidden doors, and is invigorated by beautiful art work such as stained glass or mosaics in which you can find images of Kiki, Nausicaa and Totoro among other charming Ghibli characters. But there are no equivalents of Cinderella’s Castle, Space Mountain nor any “real-life” Mickey Mouses to greet you. 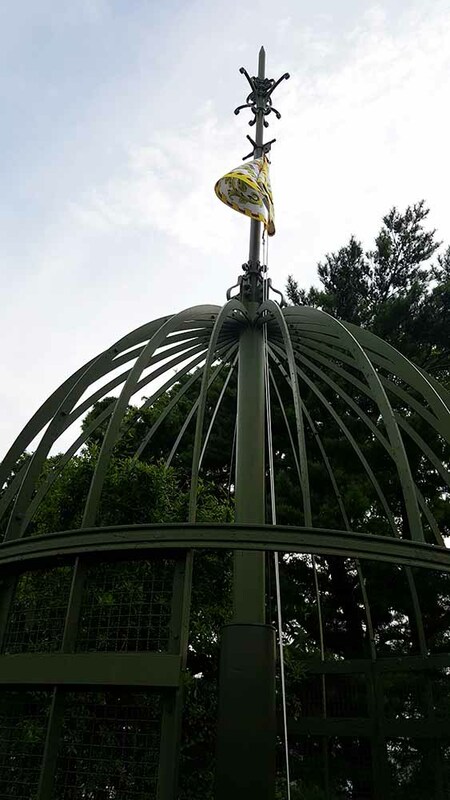 The entrance of the Ghibli Museum. 17 years since its opening, the buildings are covered by thick vines. You can climb to the top of the tower via a narrow staircase. The permanent exhibition gallery has five rooms that demonstrate how the production process worked at Ghibli. You can see many original drawings that determined the characters, their personalities, movements, feelings and interactions with others. It is eye-opening to learn that it takes years of laborious work by many animators to create a film that only lasts for two hours. Their uniquely analogue yet beautiful films are the result of countless hours of painstaking hand-drawing and re-drawing, that fill every second. (Each second of film typically contains 24 separate frames.) Studio Ghibli used to be an exceptional company in Japan, directly employing animators, rather than hiring them as contractors, in order to provide them with a decent working environment – until they dissolved the production division in 2014. The temporary (special) exhibition at the time of my visit was “Delicious! Animating Memorable Meals,” which featured how Ghibli films approached food – from bacon & eggs in “Howl’s Moving Castle,” to the weird party food in “Spirited Away” and the ramen bowls in “Ponyo”, that fascinated audience with unparalleled fantastic-reality. There is also a small movie theater in which you can watch the original Ghibli short films that you cannot see anywhere else. I was lucky to see “Boro the Caterpillar,” directed by Hayao Miyazaki – his first production since ”The Wind Rises” released in 2013 – with “sound-effects” by highly-respected Japanese comedian Tamori, who not only voiced all the bugs that appeared in the movie, but also all kinds of other sounds such as the wind, buzzing bees, a moving bicycle and squeaking doors. There is no conventional music soundtrack used in “Boro,” except that Tamori, who’s also an avid Jazz fan and an accomplished trumpeter, added rap-like rhythms and sounds to emphasize unique moments. “Boro” became Miyazaki’s first production using CGI (computer generated images), but it was a long way coming for a self-claimed “絵草紙屋 (ezoshi-ya)” – the name for an old-fashioned picture book creator back in the Edo era (1603-1868). He had to re-do the entire production 6 months before the scheduled release date (which was eventually delayed), because he was not happy with the outcome. “I did not want John Lasseter of Pixar (Miyazaki’s long time friend and collaborator) to watch this and say: ‘Hey, he is still not sure how to leverage CGI,’” he is quoted as saying. Miyazaki needed to embrace new technology 100% his way. Actually, if you are like me and not familiar with the animation production, you won’t be able to tell if it uses CGI or not. It is just a beautiful film, full of a “sense of wonder” from the perspective of a caterpillar. And last but not least, the kids can ride on the Cat Bus (neko basu from “My Neighbor Totoro”). Of course this message doesn’t stop visitors, who come from all over the world despite the hassle to secure tickets, from spending their time taking selfies in the outside areas where cameras and phones are allowed. Why is Ghibli so adamant about NO photos? 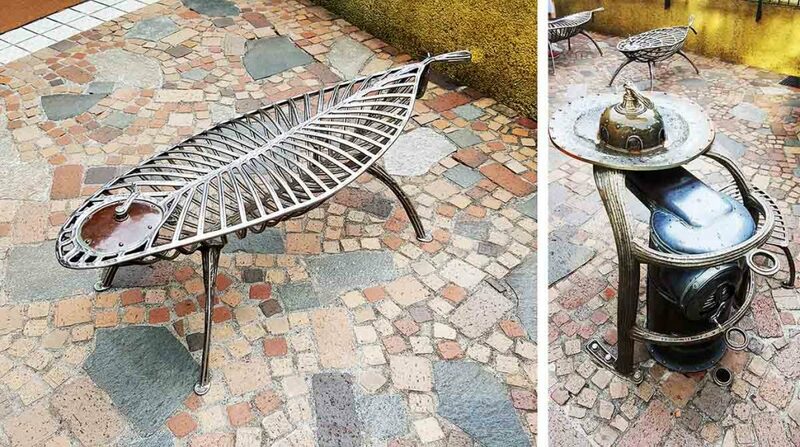 It may have to do with their aesthetic philosophy and how their “fantasy world” is created. You may think Ghibli’s – especially Miyazaki’s productions – belong to the first type of fantasy, but the second approach is probably what made Ghibli films so Ghibli, rather Disney or DreamWorks. That is the reason why the Ghibliland cannot be a Disneyland. In a different interview, Miyazaki said that you should need to watch an animation film only one time. “If you liked it a lot, go home instead of watching it again.” You wouldn’t say that when you run a production company! What did he mean by that? 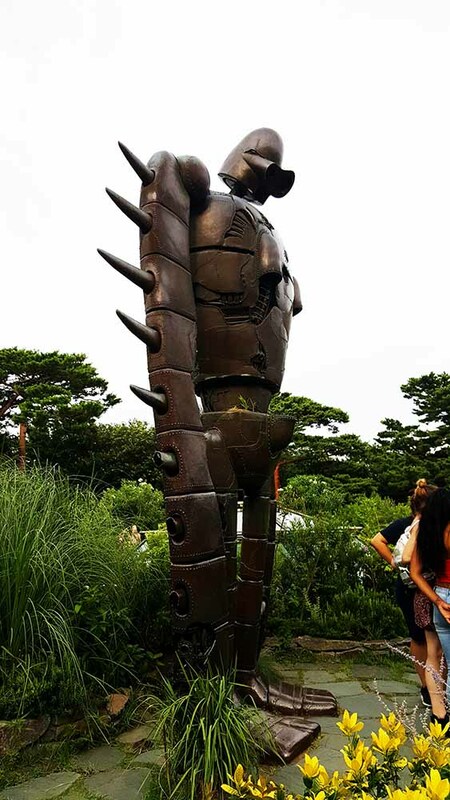 The Robot Soldier from “Castle in the Sky”. He is the Guardian of the Museum. If you end up taking photos at the museum, your fantasy and memory will be defined by what’s visually captured in them. But Ghibli wants visitors to experience something much bigger, or maybe wants us to remember that we are all capable of creating a personal fantasy that’s boundless. 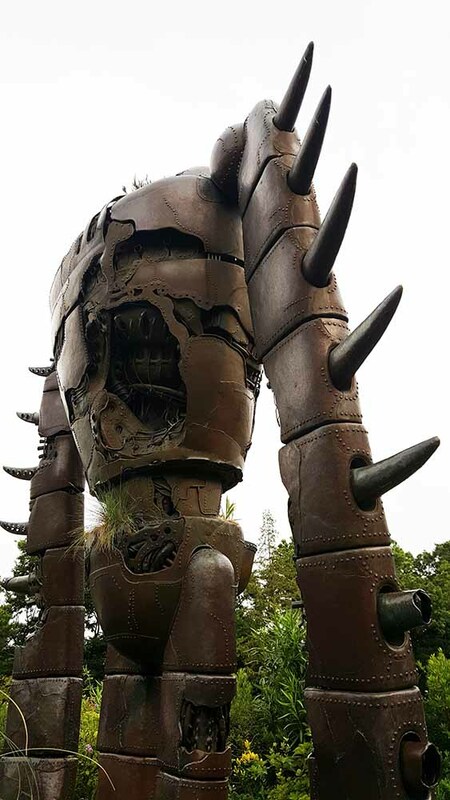 As the slogan created by Miyazaki for the museum says, the best way to enjoy this place is “get lost together” among the Ghibli characters. Forget about selfies, you are about to discover the power of your own imagination.